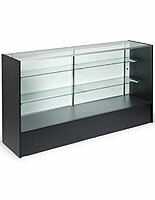 These black cashwraps with tempered glass shelves are perfect for large department stores, malls, and when purchased singly, smaller showrooms. 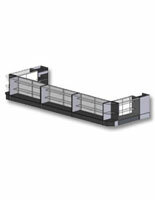 These checkout counters in affordable melamine material are priced low without sacrificing beauty and quality. 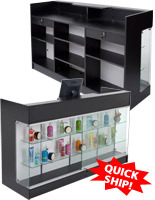 These cashwraps with tempered glass shelves, also known as compact store configurations, offer a generous amount of storage despite their streamlined footprint. 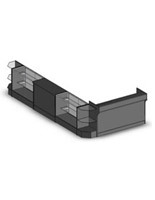 This type of glass is preferred by many store owners over conventional because it breaks into large shards that are safter to handle than shattered glass. 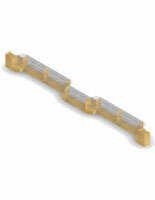 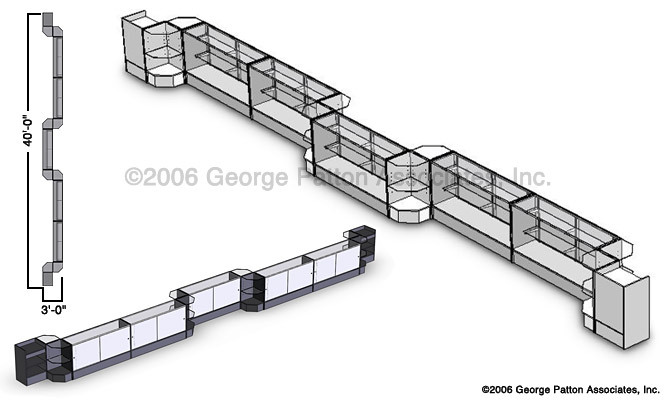 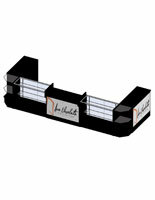 These retail fixtures include two cashier or register stands, eight corner units, and five 72"w showcases. 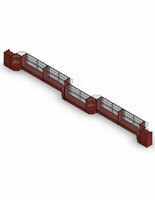 Each of these cashwraps with tempered glass shelves, also known as point of purchase desks, are modular store configurations constructed of low-pressure laminate from our economy line. 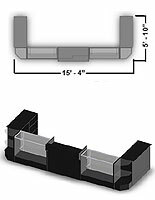 While not as durable as those counters from our deluxe line, these sturdy stations still maintain their appearance over time.